Ron Anderson, the maker of the fancy kitty drum carder, asked for some customer photos to add to his website's scrapbook page. It is also part of the requirements to be entered in his contest at the fancy kitty group on ravelry. 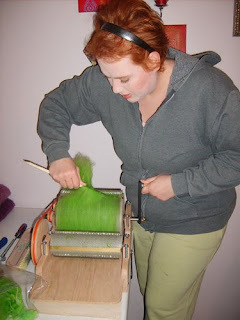 I normally hide from the camera, but I made an exception in this case and had my husband snap a few photos of me working with my drum carder. 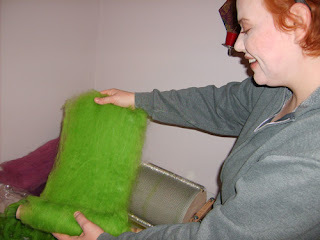 The wool that I'm working with is some that I hand dyed in preparation for carding. 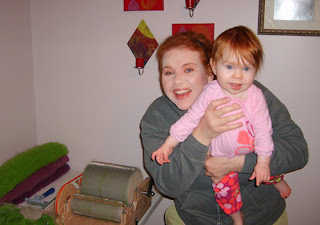 I plan to combine some of the carded colors later to make funky fun batts for felting and spinning. I will also be selling some of the wool batts at my Etsy Fiber Shop so be on the lookout for them. There's also a cute one of the baby, and I just had to share! And Happy St. Patrick's Day to you! Looks like fun! I can imagine all of the fun mixes you could make into batts! Your daughter is ADORABLE! Love the red hair!!!! I'm really excited about getting all the basic colors carded so that I can start combining :) And, thanks so much for the kind words about my baby girl! ...and your hair looks adorable, Shalana! !